The new iteration Cube (designed by Rom Colthoff and Witt while still at Quadrangle Architects and now raw design - ongoing) is one of the most exciting condominium schemes to launch in the hot Toronto market. Units have been made smaller, more in keeping with market demand and response has been fantastic - the building sold out in two hours. 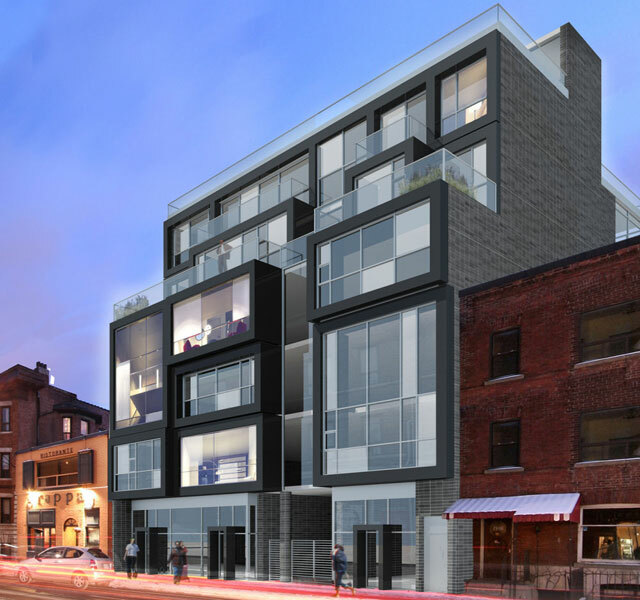 The Cube project is an intimate condominium development at the edge of Toronto's old Little Italy. Each apartment in the building is unique including some double height units that together form a dynamic yet urbane composition as a complement to the trendy neighbourhood. The shared vehicular court is flanked by ground floor retail space which, along with the condominium project, helps to appropriately intensify the existing neighbourhood that is among Toronto's liveliest. Banking on a good fit, Neilas and raw design are planning other main street developments for Toronto. raw design is one of the most vibrant new architecture studios on the international scene. Co-founded by award winning architects, Roland Rom Colthoff and Richard Witt (formerly design partner and senior design architect at Quadrangle Architects), raw design arrives with a high-profile list of clients and a breadth of experience that extends beyond the typical threshold of other local practices.